Most likely is. And so is using the steam wand cloth to wipe down the bench which I've seen a few times in cafes. How about the basic hygiene standard of washing your hands after going to the toilet? I am amazed how many males (wearing clothes that easily identify them as being in a role where they are in contact with food) do not wash their hands after going to the bathroom. You would think that at the very least they would wash their hands upon returning to their place of work, but I have seen them ignore even this "etiquette". I worked at a very low-end restaurant as a student but to their credit staff were told that after clocking on the very next step was to wash hands and forearms with soap in the sink before entering the kitchen. It only takes a small policy shift to save a lot of money!!! That is like people licking their fingers to make it easy to grab a paper bag to put your pasty in . I also have a problem with people who lick their fingers in order to turn a page in a book....makes you wonder about the multitude of sins that has gone before you get to read a book that you borrow from a library! I am a LM devotee. I have visited the factory in Florence and count it as one of the highlights of my European visit. I have owned a single goup Linea for nearly six years now. 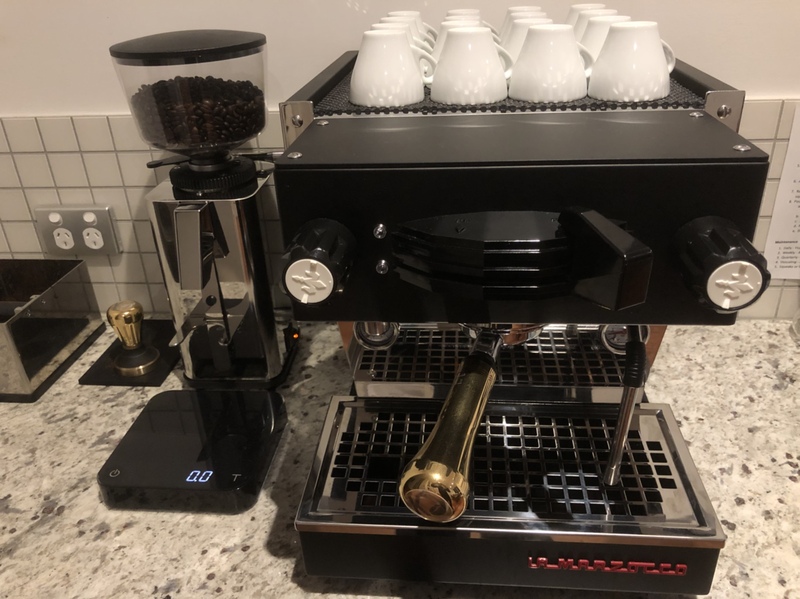 I could have bought the GS3 instead but pimped the Linea with a Piero group cap and other mods in the interest of obtaining a machine that would last for decades. Besides fitting a new pump last year and a new water level probe back in 2010, it hasn't missed a beat. Is it over-designed for home use? Don't know about that. 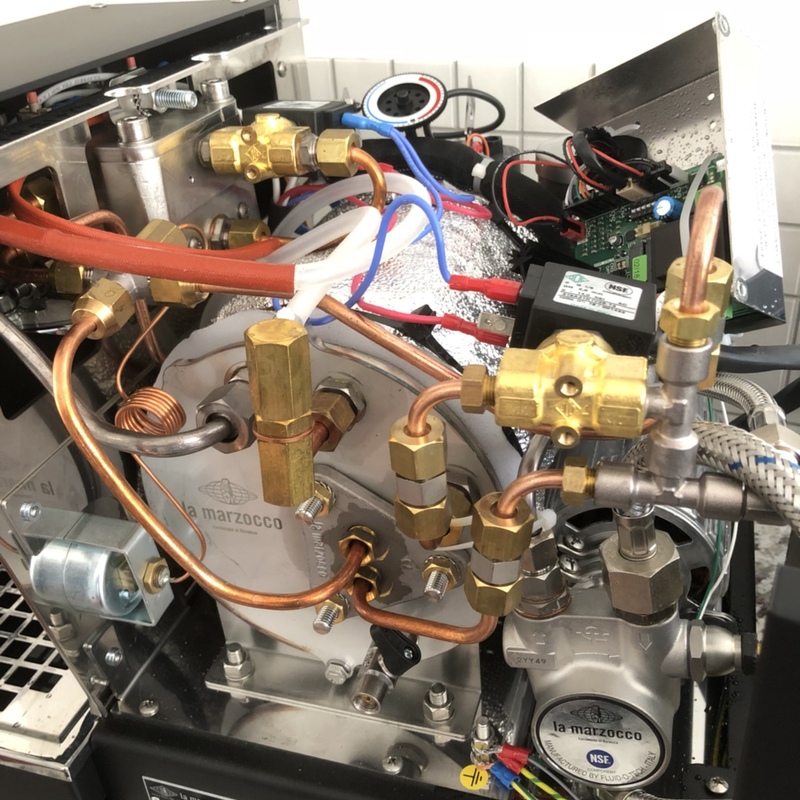 Its grouphead reaches operating temperature 15 minutes after turning the machine on...it feels like it will go forever. Will the mini keep the flag flying for LM? All press from people who have actually used one (that I have read to date) has been quite favourable. If I had room for another machine I reckon that I would get one. I wish LM well with this venture. I certainly do Paulo, I am sure my belly flips each and every time I see it. Hubby does it with books, his books, and it grosses me out *insert puking smiley here*. OK, I now have a La Marzocco Linea Mini on my bench for training sessions. There’s some serious engineering in there. Oh wow.... how cool is that! Look, they've even rebranded the fluid-o-tech rotary to pretend it's their own. Ah wow... very cool Paul! What a privilege to tinker with! Yes, a nice bit of kit that’s for sure. The internal complexity is a little staggering but I can see that the engineering translates to results. The performance of the unit is fantastic. Also, the 1.8 Bar steam pressure is fantastic and my milk texturing has lifted a level. 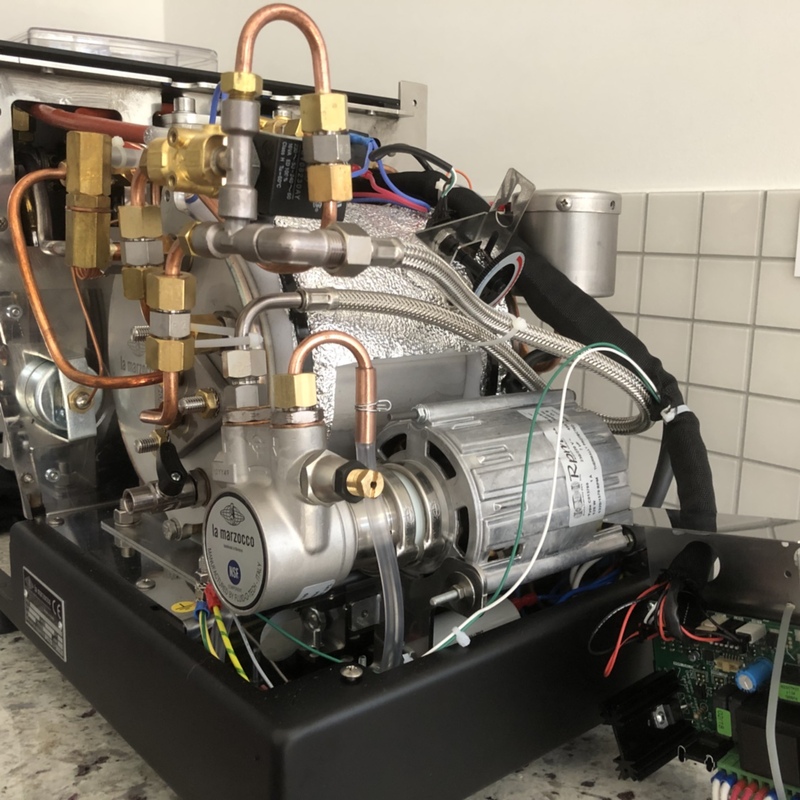 wow that's like a coffee machine on steroids! well done ! any photos of the exterior available? Nicely matched with an ECM S64 Manual. The ECM S64 manual works well as the ECM badge is on the back. Is the paddle a switch only or does it vary pressure? It’s just a fancy on/off switch Brett. you must be getting old mate you keep repeating yourself! Regardless its one very tidy looking unit! Im slightly jello! but all that caffeine must keep you firing on all four cylinders ! and yes, that would probably be my dream home machine of choice!